Virgo Matrix 2017, oil on panel, 5.5 x 5.5 inches is among the 175 small works selected for the 2019 Small Works Exhibit at Five Points Gallery in Torrington, CT. The exhibit is up through Saturday, February 23rd. See link to gallery for hours and directions. Given the theme of "Dialogue" and asked to write an essay regarding my work, this link will bring you to the page of the Fall 2018 issue of the Maine Arts Journal that features my recent work. Opening July 23rd and running through August 18th is the most recent body of work by Lori Tremblay with sculpture by Hugh Lassen. The Artists' Reception will be held on Saturday, July 28 from 4 - 6 pm. 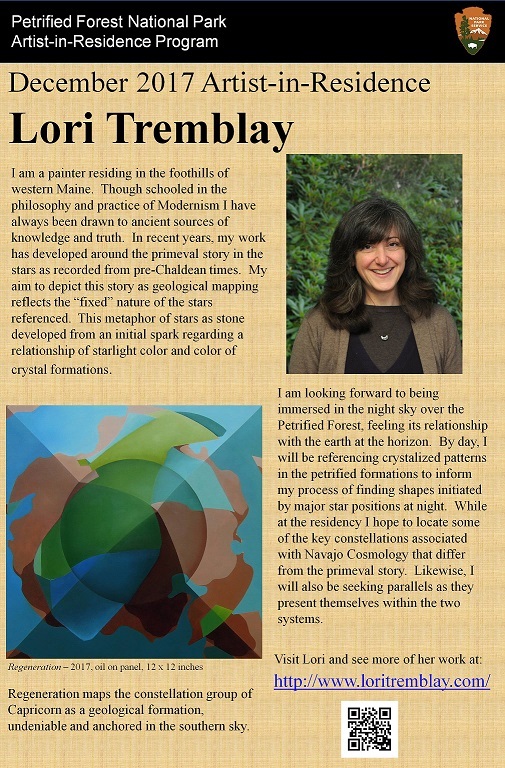 Lori will give a 30-minute talk prior to the reception at 3:00 pm for those interested in hearing how the story in the stars is being told through the medium of paint. Upon arriving at the Petrified Forest I began visiting each of the marked sites and landmarks identified throughout the Park, seeking to get a “feel” for this place. I had a very thorough tour of the Paleontology Department which gave me an appreciation for the depth of work involved in discovering, documenting and preserving its history. No matter where I was inside the park, I couldn’t help but feel the presence of water, though it is a dry and arid environment, the visual impact of water is everywhere! Having had the introduction by the Paleontology Department and sensing the Park’s history as I walked and looked, I felt my task would be to create a painting that embodied a sense of being inside the Petrified Forest. I have referenced the patterns and colors of the petrified wood in the body of the painting, being mindful not to describe any one piece, but to allow the sense of all coming into being inside the circular composition. Its very center carries the feeling of a continent, perhaps Pangaea herself, as she is surrounded by the colors of petrified remains. Time ripples out from the center and culminates at the four corners, each of which describes a unique land formation from within the Park and is referenced on the back side of the painting. Over the entire composition flows the Milky Way, perhaps unchanged since Pangaea’s inception. I structured the central area around the constellations of Taurus, Orion, Auriga, Eridanus and Gemini: the major constellations appearing in the night sky during the month of December after sunset. The stars represented in each corner are extensions of that inner structure. The painting’s title, Pangaea's Heart, references the paleontological perspective of the Petrified Forest National Park and its many facets from beginning to present day.